Which 510 is that? Fat daddy? 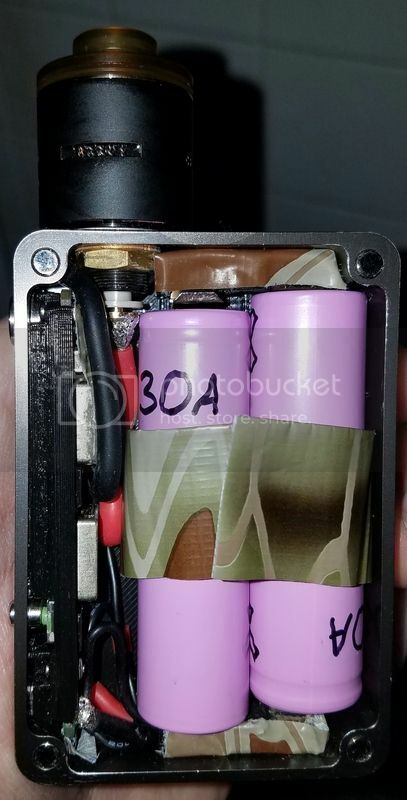 I used a varitube V2 and I think it protrudes more into the enclosure. It is almost resting on my battery. I mean it is so so close. I want to do a pink or a green one. I was thinking of sanding off the anodizing in some places and using a chemical blackening agent to make it two tone. Glad you got yours figured out too. My magnets creeped out a hair as well. I used 5m epoxy. I let them sit hours and hours. Still have a teeny gap because of it. I wish there was a way to soften them up to get them out and back in. I'd really like to put the smallest film of RTV in the gap so that when the door is on and I'm dousing the atty under water it doesn't get in the door crack. Yeah it's a fat daddy v4....I'd stay way from the v5s. The v4s are easy to work with. If you 2 tone yours let me know how it works out. I'very been considering playing around with home anodizing. Also, I have no idea why my epoxy didn'the set completely after 10 hours, but I thought they were good, removed the clamps and they crept....argivating. i'm thinking about drilling tiny holes to eliminate the hydraulic effect next time. I used magnets on the reverse side of the door and those stayed in fine and hardened like they were suppose to. I masked off the interior and just took a Dremel to the offending magnets. They were only protruding a hair so I just knocked them down and my door sits flush now. The dust is obviously magnetic, and would be all through the inside wreaking havoc. So if you do it. Mask off the inside completely and take your time. I used​ a worn out cut off disc and just feathered from the magnet out to my taped off portions. Then hit it with aluma-black. The dust will periodically ignite even if you are careful to wipe it away from the area you're working on. So be smart. Without a finish, won'the the magnets start corroding almost immediately? My last set did, but maybe that was the remnants of the finish that corroded.The hair line crack doesn't offend me much. Not sure. I hit the worked over areas with BC aluma-black and then applied a thin film of clear RTV to the entire edge of the case, then wiped it mostly off. The magnets turned black, as did the aluminum that I managed to scuff the anodizing off of. My magnets were chrome plated and when I tried to heat them to soften the epoxy. (With a soldering iron) it took a little of the plating off anyway. That's when I decided "whatever" and the grindy bits came out. Relieving the magnet holes like... O- may be the trick. Just running a teeny drill bit against the inside of the hole to give it a way to sink and allow the air out should work. I have a smaller routing bit I could run in the dremel, but I hate using it. Those little metal "hairs" always end up in me.